Join us on September 17 for Swift Fox Day! We’re celebrating one of the Canadian prairie’s most iconic species- the swift fox! This little fox might be small in size, but their status within their ecosystem is HUGE. So why is it important to celebrate (and save) this fox? Join us on September 17 for a day of fun and festivities. Join us for Swift Fox Day on September 17, 2017! Learning about incredible Canadian species like the swift fox is party- so we’re throwing one! Join us at Cequel Energy Lodge (the otter building) in the Canadian Wilds from 10 a.m. – 2 p.m.! How can you enjoy the activities? Get a foxy tattoo airbrushed! Play games – can you spot the fox? Spot the fox in person- Calgary Hitmen mascot Farley the Fox will drop in from 12:30 – 1 :30 p.m.
Why are swift foxes important? Swift fox are important indicators of a healthy grassland ecosystem like our Canadian prairies. They are also an umbrella species- by protecting them you also protect the habitat of numerous other grassland species! Threats swift fox face: habitat loss, habitat fragmentation, they are prey for coyotes and red foxes, being hit by cars, disease, poisoning and trapping. Swift foxes vanished from Canada by 1938, but thanks to reintroduction and recovery efforts started in 1983, they are found again in the short and mixed grass prairies of AB and SK. A recent reassessment of the swift fox population status had resulted in changing the federal listing of this species from Endangered to Threatened in 2012. This is good news- but our work isn’t done yet!! During the live catch-and-release trapping, researchers collect a variety of information. What we’re doing to help? Since 1998, the Calgary Zoo and its partners have monitored the swift fox population in its Canadian range in Alberta and Saskatchewan, and in its American range in Montana. 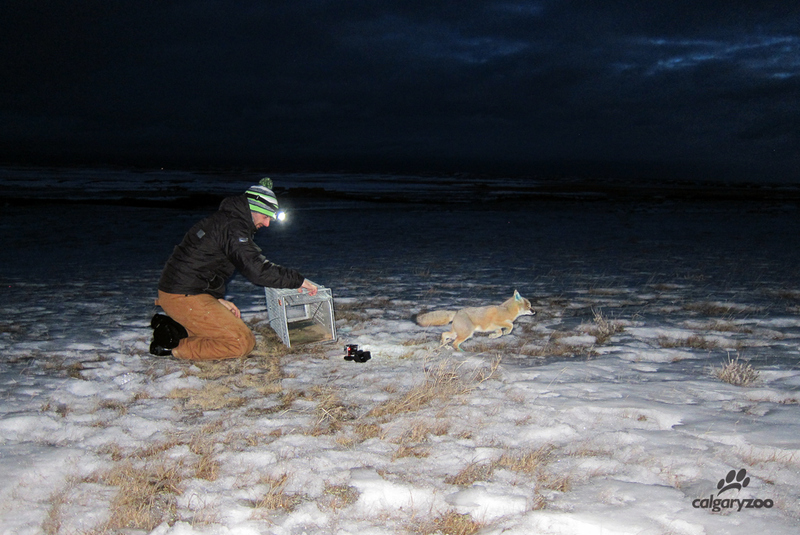 The Calgary Zoo sits on the National Swift Fox Recovery Team for Canada and has been conducting extensive swift fox population censuses to monitor the foxes’ progress. Despite significant headway in the Canadian recovery effort, Canada’s current swift fox population remains fragile and their long-term success is still uncertain. Continued monitoring and protection of habitat is necessary for the survival of the swift fox. Thanks to funding from ATB Financial, between 2013 and 2017, the Calgary Zoo has been able to continue the scientific research, field studies, and stakeholder partnerships necessary to support the recovery efforts of the swift fox. Their support has helped us create the most comprehensive data set since re-introductions began in 1983. The Calgary Zoo and ATB Financial are aligned in their long-term commitment to the environment and will continue to keep a vision of hope for a healthy and vibrant population of swift foxes in Canada. 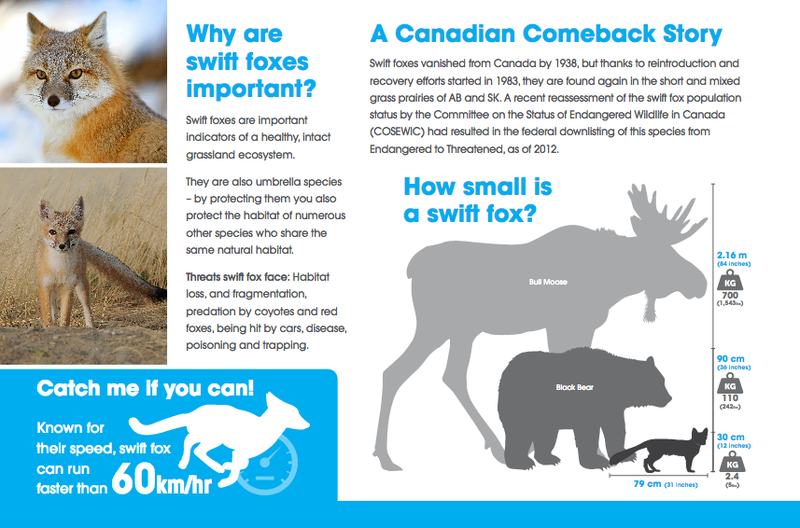 How can you help support the conservation of swift fox? A visit to the zoo supports our work in wildlife conservatio, and makes possible our critical work protecting wildlife and wild places. Visit today and learn more about the work of the Centre for Conservation Research at the Calgary Zoo.